U.S. Defence Undersecretary for Intelligence Marcel Lettre (L-R), Director of National Intelligence James Clapper and National Security Agency Director U.S. Navy Admiral Michael Rogers testify before a Senate Armed Services Committee hearing on foreign cyber threats, on Capitol Hill in Washington, U.S. The U.S. intelligence community's assertions about purported Russian hacking during the U.S. presidential election is dismissed by both the Russian government and public. 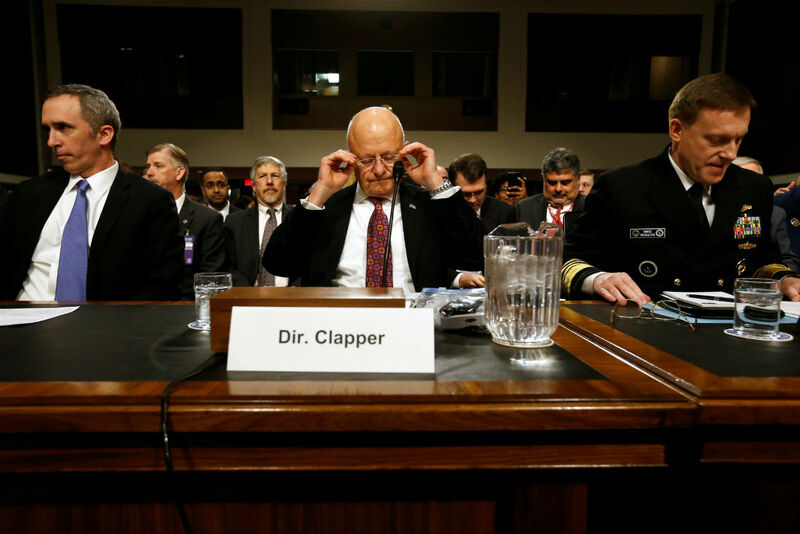 The U.S. Intelligence Report, "Assessing Russian Activities and Intentions in Recent U.S. Elections," accuses President Vladimir Putin of directly organizing hacks to influence the outcome of the presidential elections. The report, however, has been met with perplexity and derision in Russia because its public version does not contain convincing evidence. The Kremlin said it is "seriously tired" of the accusations presented in the report prepared by the CIA, NSA and FBI. "We understand that our American colleagues, in various stages of their history, have gone through so-called 'witch hunts,'" said Dmitri Peskov, the Russian Presidential Press Secretary. But such "emotional seizures," he added, should remain in the past and be replaced with a sober approach. He stressed once again that Moscow government officials and ministries have no connection to the hacks. The Russian State Duma has called the document "offensive," especially to the American people. Half of the report's public version is dedicated to the activity of RT (Russia Today), the international Russian TV channel. According to this report, during the U.S. presidential campaign RT showed a clear preference for Donald Trump, while Hillary Clinton was presented in a negative light. "The claim that Russian media could have seriously influenced American voters is a direct insult to American public opinion," said Leonid Levin, head of the State Duma Committee on Information Policy. What is even more demeaning for the U.S. political system is the affirmation that, "the publication of several facts about one of the parties could be a threat to America's entire 200-year old system of governance," said the parliamentarian. Russia's pro-Kremlin press met the American hysteria no less critically, focusing on the part of the report where the authors themselves admit that "several conclusions" about the Kremlin's intentions are based on Russian politicians' remarks, Russian media coverage, and social network posts. "The U.S. report on cyber attacks is based on TV and Twitter," wrote the Vzglyad newspaper. Passages on how Russian officials "celebrated" Trump's electoral victory, and therefore participated in the hacking attacks, indeed seemed strange to many people. For example, the report cites LDPR leader Vladimir Zhirinovsky as saying, "If Trump wins, on November 9 we will drink champagne!" These comments are not surprising because Russian officials made it clear that they do not want to see a continuation of Obama's policy of conflict towards Russia, and thus did not want Hillary Clinton to be elected, said Mikhail Troitsky, a political analyst, during an interview on Kommersant FM radio. "Their pleasure in itself… did not mean that they actively tried to help Trump," he added. Meanwhile, several Russian Facebook users reacted to the inconsistency of the evidence, or rather to its absence, with jokes such as, "Urgent! Swedish and German Intelligence Report! Russian hackers broke into the ice of Lake Peipus in 1242!" This is a reference to when Russian armies defeated the Teutonic Knights during the famous Battle on the Ice. Perhaps there is evidence in the report's confidential version that has been shown only to Trump's team, Obama's administration and Congressional intelligence committees. The public, however, is left to make conclusions based on the part that does not contain anything substantial. "Without that part the report appears extremely weak, and has no new conclusions, nor convincing argument," wrote Leonid Volkov, an opposition figure and close ally of Alexei Navalny. He added that the authors "really went astray when they used RT's digital activity on social networks as proof," said Volkov. Most Russians, however, believe that what matters is not whether or not the report is accurate. Instead, more important is the uncertain international political climate created by U.S. officials with their intense anti-Russian rhetoric.